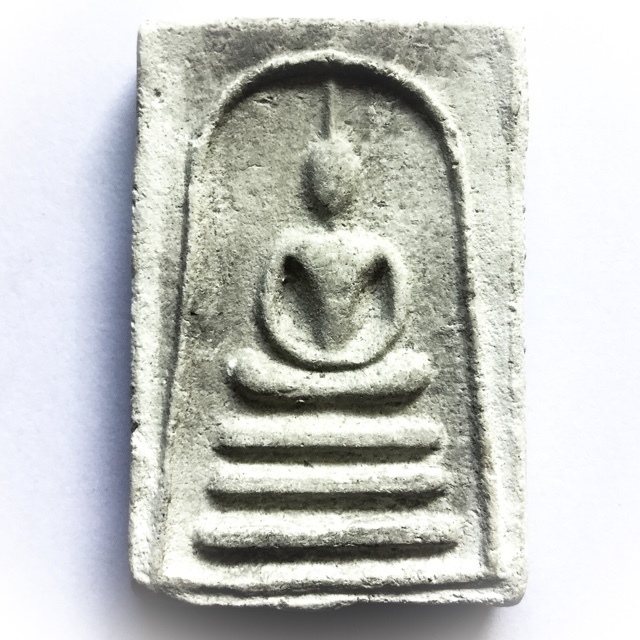 Pra Somdej Hlang Roop Muean Buddha amulet with image of Guru Monk Luang Por Guay on rear face - 'run sorng' (2nd edition) 'Nuea Tao' (gray muan sarn sacred powders). 'Nuea Graeng' (time-hardened clay), 'Hlang Roop Muean' (Image in Likeness of the Guru on rear face). The Pra Somdej Hlang Roop Muean is an etremely rare and highly favoured amulet by the Devotees of Luang Por Guay, in both first and second editions, and is one of the early Era Classics. 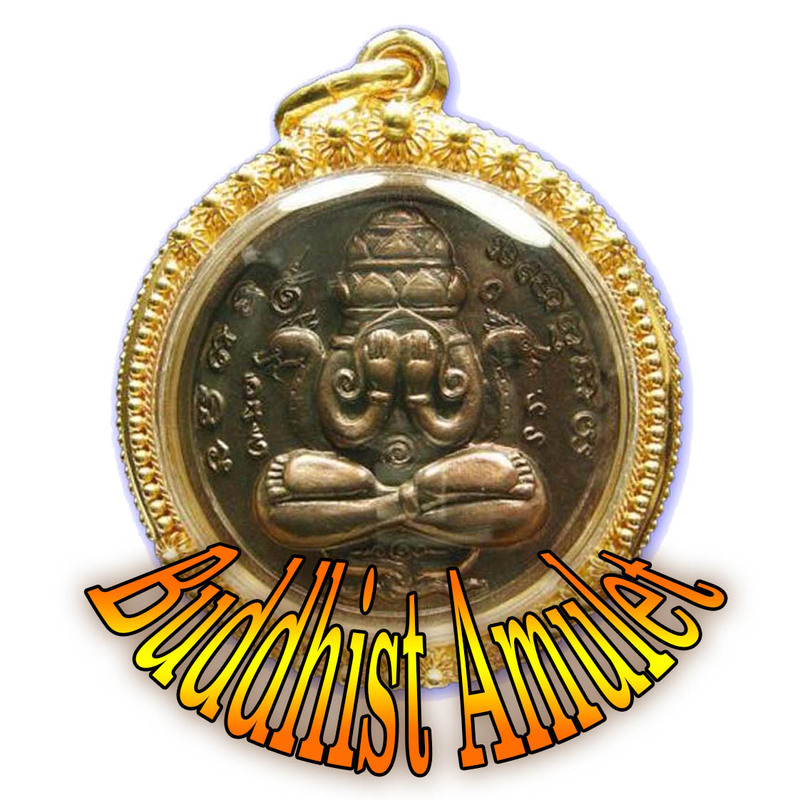 One of the more highly sought after amulets with the Devotees and Collectors of amulets of Luang Por Guay. Both first and second editions are almost equally rare and valued, for each has slight differences of the Pim (model features). 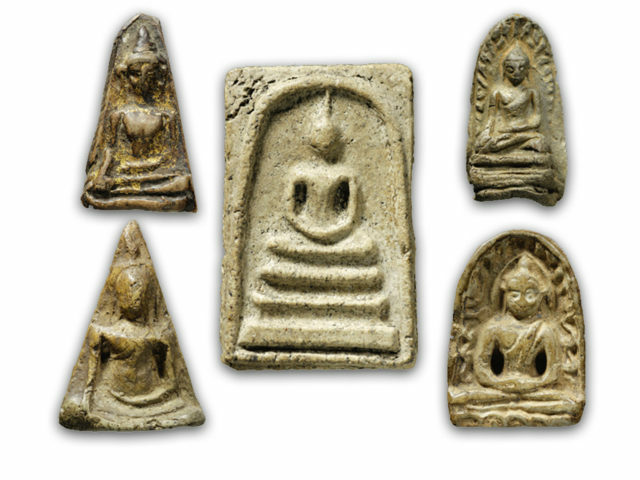 The front face of the amulet was pressed in various forms, for it is a fact that Luang Por Guay would like to take the block press molds from various temples he visited. In addition, he would perform empowerments during the various 'Reuks' (Astrological Influentian moments), to bring total coverage of protection and fortuitous blessings to all who might wear and Bucha his amulets. This ritual involved the Adept knowledge of the 'Reuks Mongkol' Buddhist Auspicious alignments, the 'Reuks Jone' (Gangster Alignments), Inauspicious Alignments, and the 'Reuks Bun Paya Marn' Demonic Influential Alignments. Luang Por Guay was born on 2nd of November 2448 in the year of the snake. Luang Por Guay was already was already able to read the Dhammapada and Pali Prayers long before he ordained at the age of seven, having learned from Luang Por Khuad. Luang Por Guay was Ordained on the 5th of June 2467 at 15:17 pm. He was aged 20 years old. Luang Por Guay was famous for his Mastery of many different Wicha, including the Wicha of Tattooing Sak Yant. Every single edition of amulets he ever made are now rare classics and highly revered for their Magical Power. On the 1st September 2491, Luang Por Guay was elected Abbot of Wat Ban Kae. He would help the poor and needy and heal the sick, give Buddha amulets to those who needed some confidence and something to help them fight on in life, and try his best to improve the life of local Folk in general. He was very loved for this by the local Folk. Luang Por was not a monk who liked to build things or develop, he liked simplicity and stillness. Even his Kuti was old ‘Song Thai’ (Thai style wooden house), that he had given the temple lay committee and some Looksit the task of building it to save money, and only hired special craftsmen for the most difficult pieces of the building. The temple thus only had old rickety Kuti huts and no fancy buildings except for the Uposadha shrine room, the Kuti Chudtintaro (memorial Kuti hut for LP Guay), and the Sala Tam Bun building. Luang Por Guay passed away, on the 12 April 2522 at the age of 75 years old. He passed on in peaceful recline. The year before he died, he fell ill, and was carried to Paya Tai hospital for examination. The examining Doctor concluded that Luang Por Guay was suffering from food deficiency since over 30 years, and gave him some protein supplements for a period of a whole month, which turned out to still not be enough for his physical needs. Pra Luang Por Guay marked the day he would become ill with blue pen, and the day he died was marked in red pen. The days were the 11th March, and the 11th April 2522 BE. Luang Por had written the Pra Kata Namo Dta Bord, and the words “I Pra Guay Na Dtandto Namo Dtandti Dtandti Dtandto Namo Dtan Dtan – will die on the 11th April at 7:55”. As the 11th came nearer, Luang Por Guay fell ill, but it was not possible to detect any fever or recognizable illness – he could not eat, and would even spit his rice out and refuse any more, instead grabbing a piece of Tagrut Foil, and inscribing spells. In the night he would hold the Sai Sincana cord and empower amulets. He would inscribe lottery numbers on the palm of his hand, and sometimes show to Looksit with Choke Lap who came to pay last respects. As the tenth arrived, everybody came to await his passing, but on the 11th he was still alive. Some of the temple committee suggested that his Kuti was full of magic and even images of the Kroo, perhaps no Deities could enter to take him. So they moved Luang Por Guay to the chanting room, where he opened his eyes in farewell for the last time, placed his hands together, and then, something amazing happened; The temple bell fell down from where it was hanging, and crashed to the floor ringing out loud with a resounding echo. The Looksit then realised that Luang Por Guay had passed on in this moment, and tuned to look at the time. It was exactly 7:55 am on the 12th April. The 12th of April every year is the date for paying reverence to Luang Por Guay at Wat Kositaram, where Looksit gather each year to pray to Luang Por Guay and ask for his blessings to continue to protect them and improve their lives.